A common back problem that can be very painful is a herniated disc, sometimes called a slipped disc or ruptured disc. A spinal disc herniation is a medical condition affecting the spine in which a tear in the outer, fibrous ring of an intervertebral disc allows the soft, central portion to bulge out beyond the damaged outer rings. This filling, or pulp, that pushes out of the disc can compress and impact surrounding nerves, causing chronic and excruciating pain. Some sufferers who have a herniated disc are not even able to move to any degree without feeling some pain in the herniated area. Although herniated discs can occur just about anywhere in the backbone, they most commonly occur in the lower or lumbar region of the spine. A herniated disc in this area can press on nerves such as the sciatic nerve causing pain, tingling and numbness in the buttocks and legs. When this occurs, what is most often needed is a surgical procedure to remove the herniation and release pressure on the nerve. It is important to note, however, that most herniated discs don’t cause any pain and don’t need surgical treatment at all. There are even some people who have a herniated disc and don’t even know it. The causes of herniated discs can be many and varied, but there are some consistent complications such as age, weight, and occupation that can result in herniated discs and make the symptoms worse. As a person ages, the cartilage in the discs begins to dry out, producing disc degeneration. This leaves them less flexible and more susceptible to herniation over time. If a person is overweight or has an occupation which involves heavy or repetitive lifting, this can exacerbate disc degeneration even more, making it much more likely that the discs will herniate. You can find a wealth of information on the causes of herniated discs and the associated treatments on respectable websites, such as http://stopmypain.info/bulging-degenerated-herniated-discs. When a patient is diagnosed with herniated discs, the source of the problem can usually be found with x-ray, magnetic resonance imaging, or a CT scan. For those who do need surgery, there are several options available. For milder cases, medications such as muscle relaxers or cortisone injections, as well as therapies such as ultrasound might be adequate. 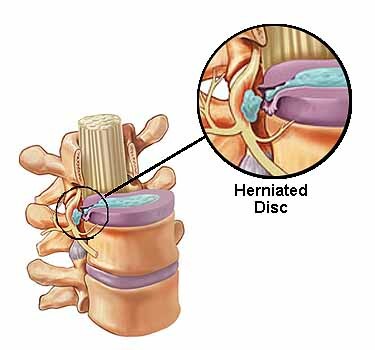 For those who need surgery, the most common treatment is removing the herniated portion of the disc. In some cases, fusing vertebrae together with metal hardware may be necessary, or there are artificial discs that can replace the herniated disc completely and relieve the pain and nerve complications upon recuperation.